Gunung Tompotika is the highest mountain in the Tompotika Peninsula – a remote part of Central Sulawesi. It gives its name to the Luwuk-based Universitas Tompotika (UNTIKA) and is also right in the middle of an area of incredible biodiversity which is looked after by the excellent Alliance for Tompotika Conservation (Aliansi Konservasi Tompotika) known locally as AlTo. Although not many hikers climb Tompotika at the moment, it has tremendous potential given its reasonable proximity to Luwuk which has regular flights from Makassar and elsewhere in Sulawesi. As is the case with many ‘small’ mountains, the trekking can be energy sapping because the trail starts at less than 100 metres above sea level and because plant growth is so vigorous that in certain places there are plenty of obstacles in the form of spiky vines and low branches over the trail. A guide who can bring a machete to clear the trail is greatly recommended as there are only a handful of expeditions to its higher slopes each year. It takes just under 4 hours to get from Luwuk to the trailhead, and what a scenic road it is. It snakes its way over to the north coast and through a large area that seems to be almost uninhabited. Gunung Tompotika itself forms a fairly sedate background to latter portions of the journey and it looks like it might be an ‘easy one’. The road quality varies from excellent to somewhat poor. You eventually reach Desa Tikupon, Toiba, Longkoga, and finally Bualemo before heading inland on a rougher track up to Tanah Merah. The trail starts on the left side of the main street in Tanah Merah (‘red land’, 95m above sea level), an aptly-named village of friendly locals living on deep red soil. Pak Dolof, originally from the island of Sumba in Nusa Tenggara Timur, is a lovely man with lots of good advice and information about the area and it is recommended that you hire local guides from Tanah Merah via him – call Anim in advance on 0852 4149 2592 to arrange this. From the village there are good views of the mountain to the south. There are several ‘puncaks’ up on the highest ridges of the mountain range, and to visit any of them you will really need at least one night’s camping. Given the rich variety of wildlife (especially birds and insects) this is an absolute joy as the sounds of nature here are rarely interrupted by the sound of motorbikes and other ‘noise from civilization’. You have a very good chance of spotting hornbills at dawn as they often flap over the camp areas early in the morning. It is advisable to allow 10-12 hours in total for the ascent and 6-8 for the descent, assuming you don’t go beyond the highest peak to the lesser peak which lies a further hour along the trail (and which local hikers seem to regard as the final destination here). The very shortest trek would entail a very early start from Luwuk, so that you can make it to Pintu Angin (the best camping spot) before dusk. Very early on the second morning, you can then continue up to the highest peak (currently unmarked) before returning to camp, packing up and heading back down to Tanah Merah to meet your driver. A more leisurely and sensible approach would be to spend the first night at either Air Kedua or Camp Damar/Air Ketiga before continuing to Pintu Angin (‘door to the wind’) on the second day to set up camp for the second night (and for very fit and motivated hikers, reaching the summit and returning to camp again). The following description assumes the latter approach. From Tanah Merah, the trail leads southwards through farm fields with the mountain clearly visible in the distance. It looks pretty straightforward and the summit lies only around 7km in a straight line from the village. However, appearances can often be deceptive! The initial part of the trail follows a water pipe and at a v-junction you can actually turn either left or right, but left is most recommended. In less than an hour you will cross a small river (Air Kesatu – 1st water -150m) and after about 90 minutes total will have reached Tempat Athena / Air Kedua (‘second water’ at 320m) where there is enough space for 2 or 3 tents. The river here is also great for having a bathe so it’s a brilliant place to camp if you started late in the day. Tempat Athena was named by Pak Dolof and Tanah Merah villagers after an injured maelo bird named Athena who was snared here in 2006 and is buried under a large rock here. From Tempat Athena, the trail begins to head up the mountainside and becomes considerably steeper. The next major point on the trail is Camp Damar (680m) which is also known as Air Ketiga (‘third water’) as there is a river just a few metres away. This is the last easy place to find water. The main trail continues steeply to a sign for Pintu Angin (820m) where the direction of travel changes to westwards. Alas, Pintu Angin itself is still a fair way off, but soon you will have emerged from the forest and will have a good view now of the north-east coast of the Tompotika peninsula. Between here and Pintu Angin itself (1220m) you will notice a considerable change in the plant species – those you might expect on a mountain considerably higher than Tompotika – indeed, it feels much higher up than it really is and there is a deep red lichen on tree branches often seen on higher mountans elsewhere in Indonesia. Pintu Angin is the flattest and largest camping spot on the whole trail and is thoroughly recommended as a place to spend the night. You are within a short walk of what are great views in clear weather. Allow up to 6 hours to get here from Tempat Athena or about 4 hours from Camp Damar / Air Ketiga. The next major landmark is a ridge of a couple of hundred metres known as Puncak Batu (1270m). Large rocks cover this ridge and it is by far the most photogenic part of the trail and probably brilliant at dawn and dusk. Do take real care here though, especially with large backpacks, as there are many hidden holes between the rocks and some tricky sections where you need to clamber across large, slippery logs. After the rocky section ends, the trails re-enters forest and onto a fairly narrow ridge. There are no further wide panoramas of distant hills but look out for pitcher plants just beside the trail (1375m – Nepenthes Maxima, thanks to Alastair Robinson for identifying them). Soon after comes the steepest section of trail which is easier to climb up than to climb down. You need to hold onto tree roots and avoid loose mud. A while later comes another ‘peak’ known as Puncak Asasia (1525m, correct spelling unknown) where there are a couple of MAPALA signs and height readings. Local hikers were right to consider this area of investigation as a peak in its own right but the true highest part of the entire mountain is another 10 minutes (or 200 metres west) further along the trail. It is unmarked, overgrown and offers no views! It is, however, the true summit of the mountain, so baggers take note! Allow about 2 hours to get here from Pintu Angin. For some unknown reason, signs at Puncak Asasia suggest that Puncak Tompotika is another hour along the trail (so roughly 50 minutes beyond the highest, unmarked point of the range). This final slog is pretty tough, with vines and fallen trees blocking the trail and requiring you to take off you backpack to crawl under obstacles before putting it back on again. It’s tiring work, and the trail seems to lead more down than up. After one hour from Asasia (or 50 minutes from the actual highest point of the range) you will reach what locals call Puncak Tompotika (1495m). It’s nearly 50 metres lower than the true highest point, but is adorned with a flag wrapped round a tree and space for a couple of tents. There are no views here and adding this extra hour each way to your trek is not especially advised as you will have already gone past the true high point and this spot offer no views nor is it anywhere nearly as good for camping as Pintu Angin. In brief, the key points on the higher slopes of the mountain are: Pintu Angin – Puncak Batu – Puncak Asasia – Puncak Tertinggi (the real peak) – Puncak Tompotika. It takes roughly 6-8 hours to descend from the highest peak to Tanah Merah, and that’s just another reason why camping at Pintu Angin makes more sense than lugging your heavy equipment higher up the mountain and past the highest point and on for a further hour to so-called ‘Puncak Tompotika’. If you do end up spending a night either here or at Puncak Asasia, note that water is available, but given the distance and descent required from each of these places it should only be considered in an emergency situation as it will require more effort than simply bringing up another big bottle with you from Camp Damar. Bagging information by Dan Quinn (February 2017) Thanks to Jonathan Wilshere and Ayu and Stephen for putting me up in Malang this month. Thanks also to Marcy, Anim, Pak Dolof, Syahrul and Ilham. Getting there: You can fly to Luwuk from Makassar. From Luwuk it takes 4 hours by car to reach Tompotika. Car with driver can be hired for Rp400,000 plus Rp100,000 for fuel (each way). Accommodation: Several hotels in Luwuk. Our pick is G Hotel on Jl Dewi Sartika – very friendly and good value at Rp275,000 (February 2017). Permits: Please speak with Pak Dolof in Tanah Merah and hire a local guide via him. Water sources: Best options are Tempat Athena (320m) and Air Ketiga/Camp Damar (680 m). Allegedly there are water sources high up, accessible via lengthy downhill treks from Puncak Asasia and Puncak Tompotika, but we recommend filling up at Camp Damar. Sulawesi Tengah Kurang Tinggi. permalink. After a 3 year absence I finally made it to the top of a new Ribu. A trip to Tompotika had been planned for a while, but due to funding constraints and Hebridean goings-ons it had been delayed again and again. Was it worth the wait….? Yes, but the weather gods could have been a little kinder on day 3. Myself and co-hiker John flew in from Jakarta via Makassar with Sriwijaya Air, starting at 5am. 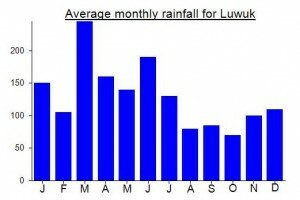 We were both expecting a propeller plane rather than a 737 jet for the second leg of the journey – perhaps Luwuk is growing in size and prosperity. Indeed, the airport is currently undergoing renovation work and it took a good half an hour before baggage was dropped off near the terminal building. A lovely location though, right next to the ocean. I’d asked Marcy Summers, Director of the Alliance for Tompotika Conservation, for help in finding a guide and she had put me in touch with Anim (0852 4149 2592), the Operations Manager who lives in Luwuk and was waiting for us when we arrived. You normally need to ask 30 days in advance if you want a member of the conversation team to guide you up the mountain, so in this case we were put in touch with a couple of keen local hikers from MAPALA UNTIKA who had climbed Tompotika before (led by Syahrul 0822 9333 8894 who has also hiked to the top of Tumpu – another Ribu in the province) . We also had a driver sorted out so we could set off for the mountain immediately. If you need supplies and gas for cooking, try Golden Hill. 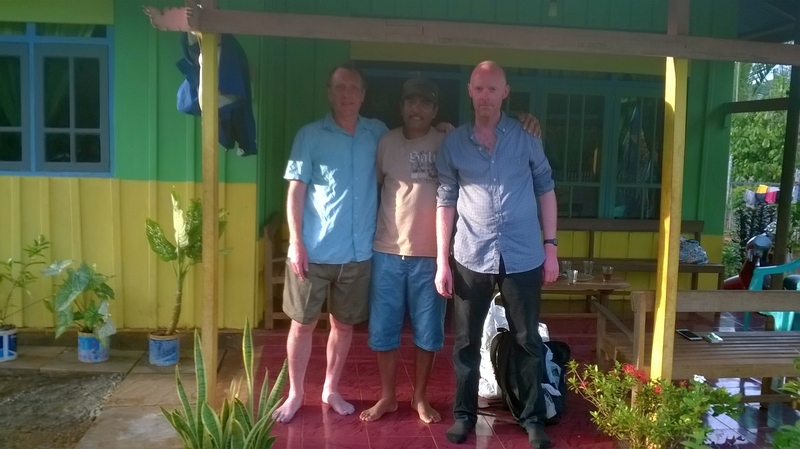 We arrived at Tanah Merah around 4.30pm and called in to see Pak Dolof, who was very surprised to hear that I had been up Wanggameti (in faraway Sumba where he comes from originally). Pak Sukrabo is the Kepala Dusun in Tanah Merah, but on this occasion we didn’t meet him. After a quick tea we set off with less than an hour of daylight left, walking gently in the direction of the still distant mountain, over rich red earth. We camped at Air Kedua – a very nice spot for a dip in the river, and very little chance of feeling cold at night as you’re only a bit over 300m above sea level. We were up before 6am for a 7am departure from camp for what would be a very knackering day. As I often say, the small mountains are often the toughest of all, because plant growth is faster meaning blocked trails, plus the heat and humidity is more intense when you are hiking just a few hundred metres above sea level near the equator. I had a good idea of where the highest point of the range would be, and when we reached Puncak Asasia and saw the signs that told us ‘Puncak Tompotika’ was a further hour on I was pretty surprised, not least because my GPS was telling me the highest point was only about 200 metres away (which would normally mean ten minutes or less). However, as we had decided to camp at what is known as ‘Puncak Tompotika’ and because there is little decent space for camping anywhere else beyond Pintu Angin, we continued on, GPS in hand, and marked a waypoint at what seemed to be the highest point of the range (GPS gave around 1541m). After this, when the trail started descending more than just 10 or 20 metres I started to feel more confident that the GPS was right and we had been past the true summit but it had simply not be marked by anyone. The final 50 minutes were very tough, especially with backpacks, as there are fallen logs and vines making progress rather slow. A machete here would be very useful indeed for keeping the trail open and allowing folk to avoid getting snagged by thorns etc. Upon arrival at ‘Puncak Tompotika’ – the supposed ‘peak’ of the mountain, my GPS gave a reading of around 1495m and never once budged over the 1500 mark. But the MAPALA guides were happy that we had reached the final destination and we unpacked and set up camp. There was a fair bit of rain overnight and our planned departure at 7am the following morning was delayed by the MAPALA hikers who had not got much sleep and complained of the cold. Of course, us Europeans thought the temperature up here was just perfect! The MAPALA boys started cooking rice (a time consuming process – not something to be doing during daylight hours when you have a long hike back down!) so our departure was delayed. This delay had some significant knock-on consequences for the rest of the day, as by the time we got to Puncak Batu (the best spot for photographs) the weather had changed and it was pouring with rain. We also had to rush all the way back down to Tanah Merah to meet our driver at 4pm or soon after, so we didn’t really savour the views or stop properly for lunch. In short…. a late start is rarely a good idea! We did, however, make time for some photos are the true summit of the range – and celebrated my 64th Ribu and John’s 39th. Perhaps a future hiking group will mark the spot with a sign saying it is the true peak, or perhaps it will remain overgrown and un-noticed for many more years. I did have a look around for any evidence of a trig pillar from the Dutch days but couldn’t spot anything. There were quite a few equipment casualties on this hike…. proving it’s a tough one. John found a new hole in one of his shoes, and I tore a shirt. Even worse, the Eiger backpack I had borrowed from a friend in Malang didn’t survive intact after a crucial piece of plastic snapped as I swung under one of many fallen trees on the trail! This is definitely an SAS-style hike in places! The temperature preference differences continued on the drive back to Luwuk, with the MAPALA UNTIKA lads saying they were freezing whenever I wound down the window, but me feeling nauseously drowsy and light-headed whenever I wound it back up again! We found a great hotel in Luwuk on Jl Dewi Sartika, opposite the older Karaton Hotel who didn’t reply to my email earlier in the week, called G Hotel. Rp275,000 for a standard room with early breakfast and crucially a fridge with ice-cold Bintang. Quite amusing to be spending Valentines evening with sore feet sipping a beer with another English bloke in a hotel in Luwuk pronounced ‘gay’! The next morning we took a taxi back out the airport – didn’t take long and cost about Rp70,000. From Makassar I headed to Surabaya and John back to Jakarta. Photos to be uploaded soon, once we have a new plugin sorted out…..
“At 1600 meters (c. 5000 ft), Mt. Tompotika is not an especially tall mountain. It is, however, the highest point in the region, and its distinctive ultrabasic soils combine with unusual biota and rugged topography to create a place which has long been shrouded in mystery and little-visited by humans. Considered a sacred point of origin by all three of the ethnic groups indigenous to the area–the Banggai, Balantak, and Saluan peoples–Mt. Tompotika has been largely left alone until recent years. Stories surround it, about the wild woman of the mountain who lives up there alone with her dogs and frightens away hunters; about a secret enchanted lake at the top; about the occasional explorers who tread forbidden ground and don’t return. Outdoorsy youth from the area’s regional center, Luwuk, occasionally plan hiking expeditions to Tompotika’s summit, but otherwise, few people venture into the mountain’s higher reaches for any reason at all. 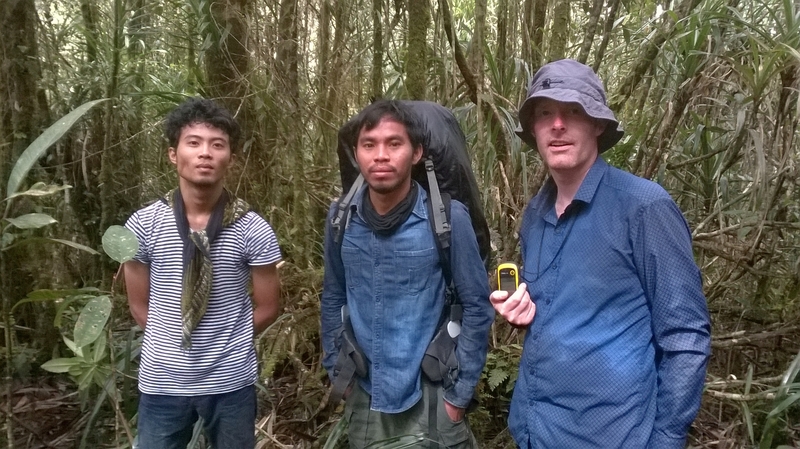 As part of our efforts to protect it in the Tompotika Forest Preserve–which encompasses the summit and a large proportion of the mountain’s slopes–the AlTo team recently made an expedition to Tompotika’s summit. Approaching from the mountain’s northern flank, the route leads up through native ultrabasic hill forest and then across a natural burned area to re-enter forest at about 1200 meters. The view from the top of Mt. Tompotika affords a remarkable juxtaposition of the strange and the beautiful, the precious and the vulnerable. On the one hand, standing in the forest at the top of Tompotika one is surrounded by an odd, otherworldly beauty. The bright green of new growth is everywhere, and yet the place feels ancient. The trees are stunted, gnarled, and covered with moss. Bushy ferns and shimmering fungi poke out through the leaf litter. Bright-red, carnivorous pitcher plants wind everywhere on their long twining vines. It is quiet, but for the wind, which whips across the mountain passes and whistles its way through the wood. It is easy to see why this place is said to be enchanted. Step out onto a ridge, however, and if the clouds clear for a moment, the entire Tompotika peninsula opens out before you. 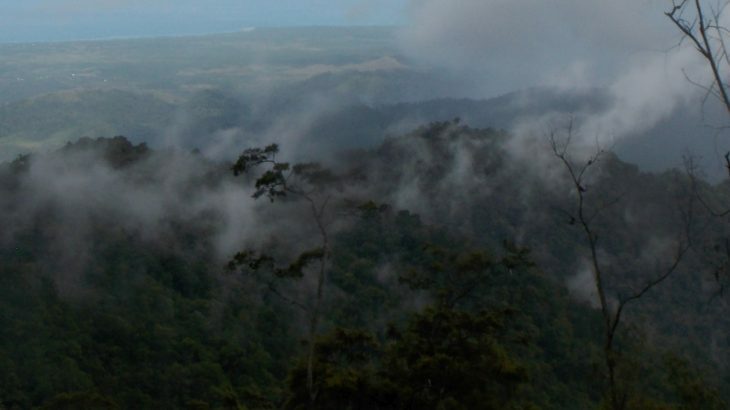 To the south and east along the Balantak mountain range, gorgeous unbroken forest for miles. To the northeast, an as-yet-intact corridor for maleo birds to travel from the mountain forests to their coastal nesting ground near Taima village, visible about 30 km away. Offshore of that, Tangkuladi island, the daytime roosting site for thousands of fruit bats that we are working on trying to protect. Each night those bats leave their island roost and fly here to Tompotika and throughout the forests we now survey, spreading seed and pollinating as they go. But along the Northern coast and increasingly toward the interior, the Tompotika peninsula’s once-forested land looks like a checkerboard, and the scarring is moving closer, even to the mountain itself. Deforestation for farming and logging is creeping up the mountain’s flanks. Nickel miners are drilling bores to assess the profit potential of feeding the world’s insatiable demand for steel and batteries. Oil palm plantations–the latest seemingly irresistible threat to Indonesia’s native forests–are being established to produce prepared foods and biofuels in the West and China. And the local human population is growing and changing: large numbers of transmigrants have come from other parts of Indonesia. Newer generations set less store in old mountain tales, and the long traditions that have kept the mountain remote and isolated have lost some of their traction. Legends are no longer enough to protect Mt. Tompotika. But, together with locals in the villages we see arrayed below, the AlTo team is working to protect Tompotika’s forests while finding new ways for humans to live sustainably in this landscape. It’s not easy, and sometimes the challenges seem overwhelming. But, with the enchanted forest at our backs, and taking in the long view from the mountaintop, we cannot help but grin. Despite the many threats, Tompotika’s forests still stand. Beauty, intricate and spectacular, endures. Conservation is hard work, but there is no effort more worthwhile, or more rewarding.